Traffolyte, sometimes spelled Traffolite, was a brand name for multi-layered phenolic plastic sheets suitable for engraving. Each layer is a different colour so engraved letters or shapes become a different colour from the unengraved portions. Thus it is widely used for name tags, labels and signs. This generic name is an engraving and sign industry standard and is used in a variety of environments. 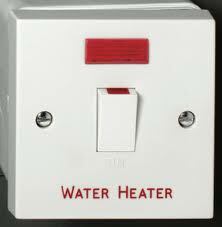 It is commonly used for labelling, signage and identification purposes. Its resistance to high temperatures makes it popular for heavy industry such as Power Stations, electricity transformers, Switchgear labelling and general control and mimic plates. Using the latest engraving machinery and software we are able to offer an expert service all the way through from initial design to the finished product. We have a highly developed Braille & Tactile sign manufactuering department which combine innovative manufacturing techniques with intelligent sign design, all of our range of DDA-compliant signs are aesthetically pleasing, robust and fully functional. Our products are manufactured with guidance from the Royal National Institute of Blind People to conform to the Disability Discrimination Act 1995. In Britain there are over 2 million people with sight loss. Displaying promenient high-contrast Braille and tactile signs in suitable positions helps negate the challenges that blind and partially sighted people must face each day. Durable and stylish metals such as brushed stainless steel are manufactured using revolutionary manufacturing techniques which set us apart from our competitors. Raster beads are integrated directly into the metal substrate with extreme precision, before the raised tactile text and pictograms are routed directly to the face of the sign. We pride ourselves on being able to fashion high quality DDA Braille & Tactile Signs from the most robust of materials. Available in a variety of thicknesses, various plastic products are available depending on the application and requirement. Manufactured in a similar way to the metal signs, our plastic range not only offers quality and durability but is extremely versatile. Full-colour graphics and logos can also be incorporated into this particular range of Braille and tactile signs, so, as well as being compliant and giving valuable information where necessary, the signs can adhere to corporate guidelines and branding. 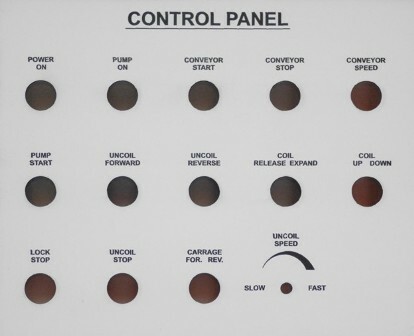 With a large range of materials to choose from, we can enable your company to finish off your item with a quality engraved control panel. Our customers regularly tell us the engraving element of their product is usually the last to be applied, which means sometimes a need for quick turn around times. Well, for us its the only thing we focus on, so let us help you achieve a professional modern look to your engraved elements. We can work alongside your design team and incorporate your ideas so you receive the product as required. Our computerised engraving machines allow us to import dxf, dwg, eps and many other vectored files therefore keeping you in control of the design process. Valve tags are ideal for your company's pipe and valve identification procedures. 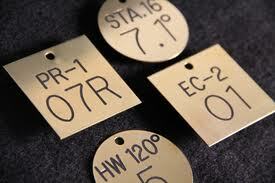 We here at National Engravers produce a variety of different valve tags in an assortment of materials. The most popular are brass & traffolyte, these valve tags are stocked in packs of 25 numbered 1-25, 26-50, 51-75, 76-100 and can also be produced with your own custom information if required . If you need serialised number sequence please let us know. We can provide various materials too including aluminium, 316 stainless steel, acrylic, wood, rubber even marble. . If you work with Auto-Cad why not send through your DXF files to us directly so you have control over the engraving process. 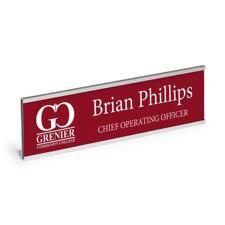 Engraved name badges have been the industry standard name badge for many years. Economical, clean and professional, engraved name badges enable companies and organisations to promote a more refined, classic and approachable image. Available in a wide range of colours and material options, our engravers can facilitate the making of an incredibly durable name badge with the minimum of maintenance necessary. As well as providing the highest quality, we also offer one of the fastest turn around times in the industry. Our competitive prices ensure you will receive the most cost effective name badge solution with the same quality and professional service. As well as providing the highest quality, we also offer one of the fastest turn around times in the industry. Our competitive prices ensure you will receive the most cost effective name badge solution with the same quality and professional service offered to each and every one of our customers.